What does it mean to think like a fish? 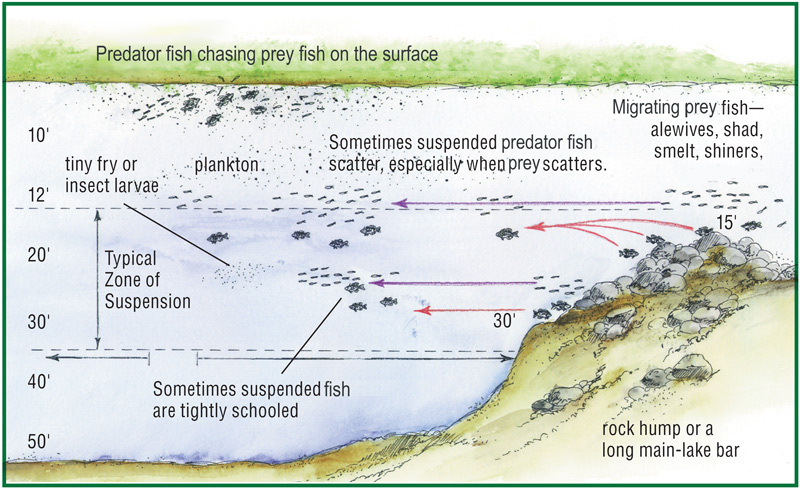 How can knowing about aquatic communities and food webs be used to improve fishing success? How can knowledge of fish adaptations be used to improve fishing success? What is “cover” for fish and why is it important in fishing? What weather factors improve fishing success? List at least five observations that would help an angler be successful. Why are rules about how many fish you are allowed to catch important? What is an ethical angler? What are some important things an ethical angler does? How do anglers contribute to fish conservation? Now that you’ve learned about Texas’ aquatic ecosystems, one of the most fun ways to use your knowledge is to go fishing. It’s a great way to spend time with friends and family outdoors. 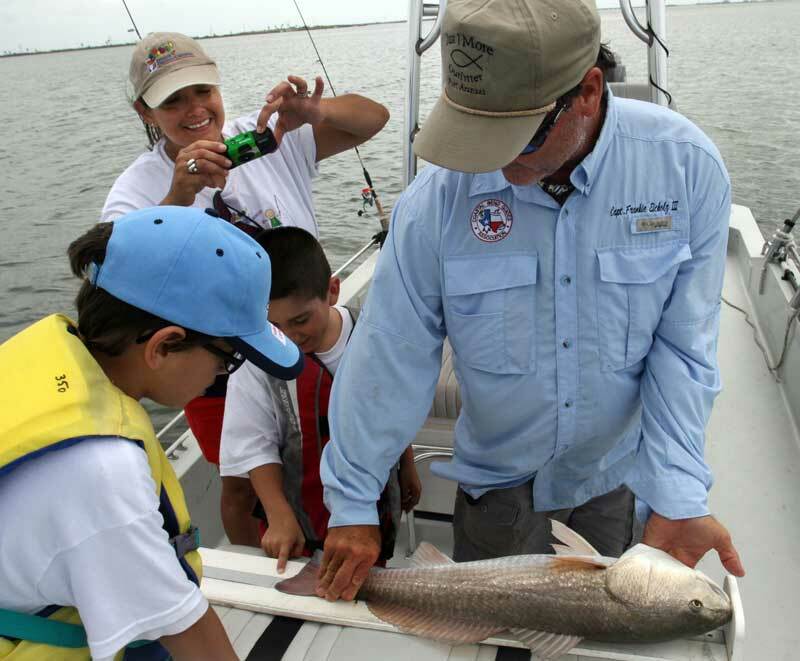 With over 191,000 miles of rivers, 212 major lakes, 367 miles of coastline, and 3,300 miles of bays and estuaries, Texas has many places to go fishing. Hike or take a canoe or boat to a fishing spot. Try camping near a lake. Cook what you catch and have a picnic. Fishing is a great way to learn about nature. When you go fishing for fun, you are called an angler. To be a good angler, you need patience, fishing skills, and knowledge about aquatic ecosystems. You can use what you have learned about fish, habitats, food webs, niches, trophic levels, and aquatic ecosystems to help improve your fishing success. Fish may scour the bottom, hunt near the surface, or swim anywhere between. Spawning brings fish together in one place. Their need for “cover” which fish use to hide in attracts them to structures in the water, such as rocks, logs, and aquatic plant beds. (Fig. 13.1) They seek comfortable temperatures because they do not use energy to maintain a constant body temperature as do warm-blooded animals. They also may move about to avoid low oxygen levels. Individual and species needs and preferences present a constantly changing, yet somewhat predictable pattern of fish activity. To catch a fish, it helps to think like a fish. What habitat does the fish like within the aquatic ecosystem? A catfish stays near the bottom and may hide inside or under objects. A largemouth bass prefers mid-water and to be near the surface, but may hide in cover so it can ambush its prey. chasing a frog. Cast your bait where you think fish are feeding. Fish use cover to escape predators and to help them ambush prey. Ask yourself, “If I were a fish, where could I hide from enemies and find food?” Cover can be anything that will hide or protect the fish. Some fish spend most of their lives near cover, moving out only to feed or spawn. Aquatic plants, docks, rocks, undercut banks, coral reefs, and logs all provide cover. Something like the shade, or shadow, from a tree can be cover, too. It makes the fish less visible to other fish, predatory birds, wildlife, and even people. Look under overhanging trees, docks, or fishing piers. Once you start looking, you’ll see all kinds of cover, and maybe see some fish. Weeds grow near the bank, fallen trees lean over the water, fishing piers reach out into the bays and Gulf, boat docks rim lakes, and big rocks often rest in the middle of streams. 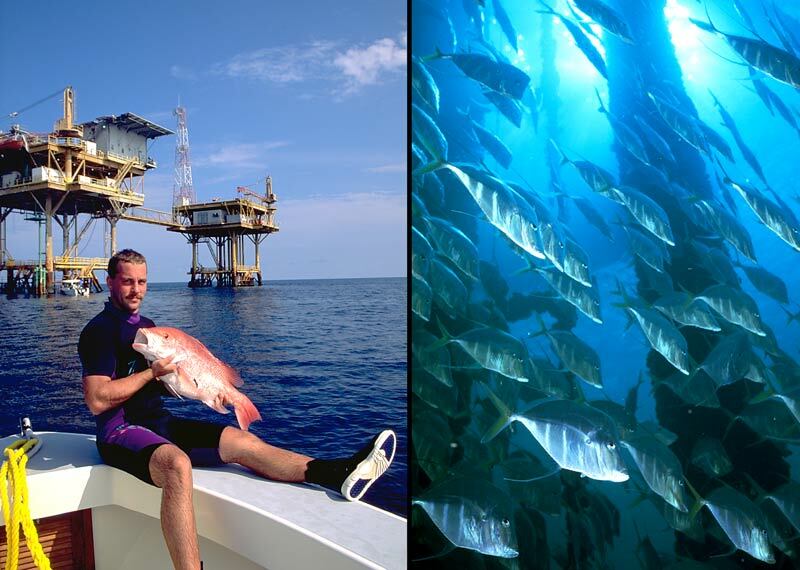 In the Gulf, oil rigs and sunken objects, such as boats provide fish habitat deep underwater and are great spots for fishing. (Fig 13.4). Like in the Gulf, a lot of cover for fish cannot be seen from the surface. Underwater rocks and sunken logs rest on many lake and river bottoms. These make great fishing spots. Cast close to cover because that’s where the fish hide out. Drop-offs, points, ridges, islands, and sandbars shape the beds of lakes, rivers, bays, and the Gulf. These features often attract more fish than do flat or gently sloping bottoms. You can find good places to fish from clues on land or in the water. Land points often extend into a lake. 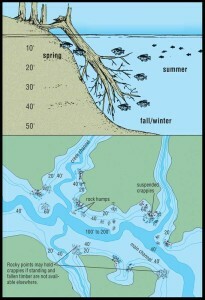 (Fig 13.5) The open area between flooded trees might be an old river channel. Texas bays and estuaries have oyster reefs providing fish cover. A change in the wave pattern in the bay may signal the edge of a seagrass bed. Hungry fish seem to like places where one kind of habitat changes to another—in other words, at the border or “edge” between habitats. The edge of a lake’s shoreline area or littoral zone, for example, usually attracts many fish. 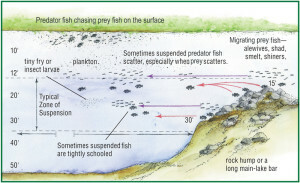 (Fig 13.6) In rivers, fish often feed where the flow changes direction or slows down. You can often see signs of these changes from shore or if you are in a boat. Look for the break between muddy and clear water in rivers and estuaries. In flowing water, there is less current near the bottom or immediately downstream from an object like a rock. Because of this, most stream fish rest with their bellies almost touching the bottom or stay in the slower water downstream of objects. They like to take advantage of spots that have less current than the nearby water. They do this to save their energy and to avoid being pushed downstream. The faster water brings food past waiting fish looking for a quick bite to eat. Most fish in a river face upstream into the flow of water and patiently wait for food to come to them. Cast your bait in front of fish in a stream and let the current take it to the hungry fish. Fishing can be good at any time. However, fish seem to prefer eating during the low light conditions of morning and evening rather than in the bright sun of midday. Fish stay in shallower water in low light, and then move to deeper water when the sun is bright. Cloud cover or shadows on the water mimic low-light periods and may help get fish to bite. Catfish, bass, crappie, and many other species of fish will bite day or night. In some clear lakes, fishing is sometimes better at night than during the day. Big fish seem to be less picky about food and easier to catch when it is dark. Fishing at night is hard, even for experienced anglers. If you are just starting out, try fishing during the evening and see if you can continue after dark. Weather affects fish, but not always in predictable ways. Hotter weather sends fish deeper to find cooler temperatures such as in the open-water zone of a lake. Most fish stay out of the deep-water zone of the lake because there is little oxygen there. Warm fronts in winter may improve fishing, and the longer the front stays the better. Cold fronts may reduce fish movements, causing the fishing to not be as good. Many people agree fishing is affected by weather changes, for better or worse. A light to moderate wind is better than no wind. A little wind gives fish in shallow water cover from fish eating birds, because the fish are harder to see from above when the water is rippled by wind. Fish will move into shallower water to feed in slightly windy conditions. Fishing can be good before and during a gentle rain but may be poor during and after a big thunderstorm. If this all seems like a lot to learn, just remember that any time you can safely fish is a good time to go fishing, and you will have fun even if you don’t know everything right away. The Texas Parks and Wildlife Department (TPWD) makes and enforces rules to conserve fish and wildlife. These rules help Texans share and keep our aquatic resources healthy. 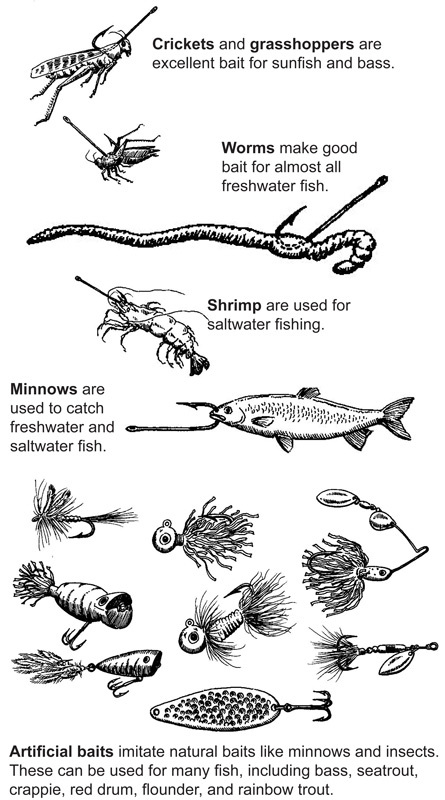 Fishing rules protect species by limiting the number or size of fish that may be taken. Length limits give fish a chance to grow and spawn before people are allowed to catch and keep them. 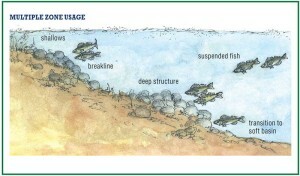 (Fig 13.7) “Slot” limits are restrictions on keeping fish of varying lengths. These kind of rules allow biologists to achieve very specific purposes. For example, a slot limit may be used to allow larger very productive fish to stay in the habitat and produce more offspring for anglers to catch. For example, red drum have a 20 – 28 inch slot limit. You are allowed to keep fish within this size range, but you must return all fish that are smaller or larger. These regulations make fishing better, but they also require anglers to know the rules and carefully measure the fish they want to keep to make sure they are legal size. 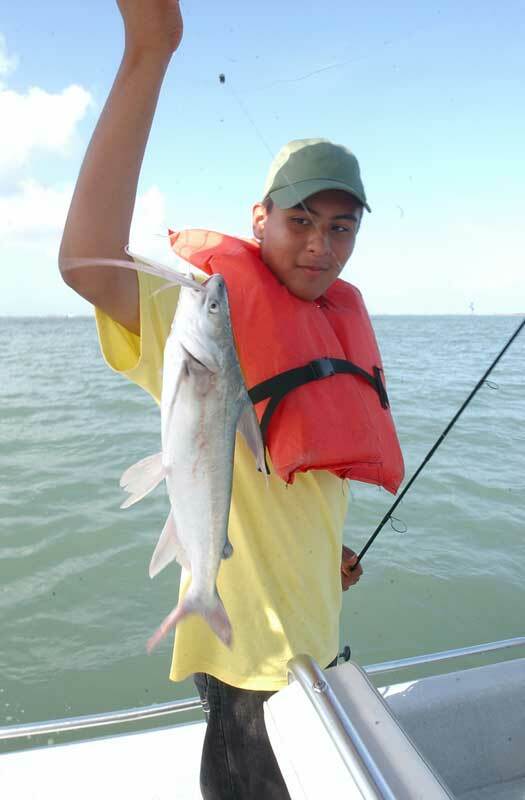 Texas’ fishing rules are based on scientific data and research provided by fisheries biologists. Taxes on fishing equipment and the sale of fishing licenses pay for this work. When you turn 17 years old, you get to buy a fishing license and help support fish and fish habitats in Texas. If you are too young to buy a license or if you go fishing where a fishing license is not required, you must still obey fishing regulations. This way everyone plays a role in fish conservation. When you purchase a fishing license or fishing equipment, you are supporting fishery management, hatcheries, conservation, and education. 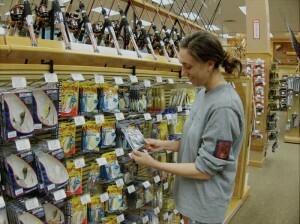 (Fig 13.8) By learning to identify fish and respecting fishing regulations, anglers help keep fish populations in balance. Catch and release is a good conservation practice, but harvesting some fish can give others room to grow. So before you go fishing you need to learn the rules and follow them. The rules can be found in the Outdoor Annual which is published by TPWD every year and free anywhere licenses are sold. The rules can also be found on the TPWD website. Following fishing rules and being an ethical angler are ways you can help conserve Texas’ aquatic ecosystems. Conservation helps make sure our aquatic ecosystems stay healthy far into the future. Texas Parks and Wildlife Department recognizes fishing excellence through its Angler Recognition Program. The program maintains records of biggest fish caught in public and private waters, and records of biggest fish from all public lakes, rivers, and bays. Junior Anglers (under 17 years of age) compete in a separate division. For more information check the TPWD Website (http://www.tpwd.state.tx.us/). Texas has many Community Fishing Lakes where even if you live in a city you can go fishing. These are public lakes 75 acres or smaller located in city, community, and state parks. These lakes are stocked annually with fish such as channel catfish and rainbow trout for fishing. Information about fishing and stocking in community fishing lakes and over 100 major lakes in Texas can be found on the TPWD website. 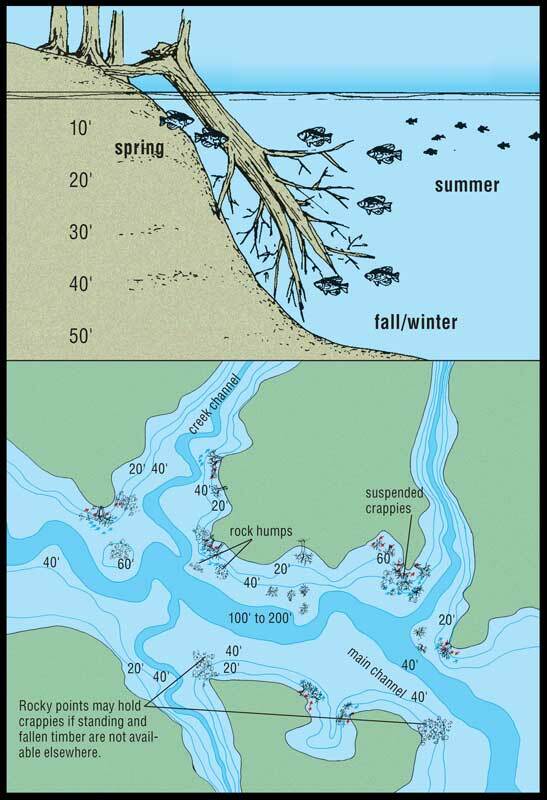 You can also go to the website to learn more about conserving Texas’ aquatic resources. Better yet, go outside and visit your favorite local aquatic resource. Begin thinking of it as YOUR lake, pond, river, stream, or bay. To help keep our lakes beautiful, consider bringing trash bag when you visit, and take a moment to leave the spot in better shape than you found it. There are many ways you can help keep fishing great in Texas. The simplest way is to just start fishing! Learn to recognize and report invasive aquatic species that can take over and ruin native habitats and area fisheries. Be safe and responsible on the water. Be a mentor and take someone fishing! Visit a fish hatchery. Join Texas Stream Team to learn more about water and become active in conserving water quality. Join a local fishing club. There are even fish conservation organizations that hold fishing contests where winners get college scholarships. (Fig 13.9) .And if you’re up to the challenge, choose a career in conservation and make aquatic resources your life’s work. Above all, enjoy your aquatic resources and use them wisely! 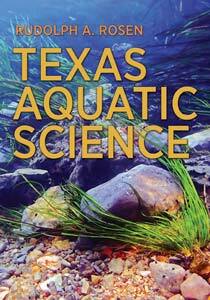 Texas Aquatic Science Fishing for Conservation was written and edited by author Rudolph Rosen. Project support came from the Ewing Halsell Foundation and the Sport Fish Restoration Program. Fig. 13.3 — Some species of fish may move off structure and into open water to feed where they suspend themselves in the water. This is often in response to following or searching for prey. Food often determines where you find fish. Credit: The In-Fisherman.